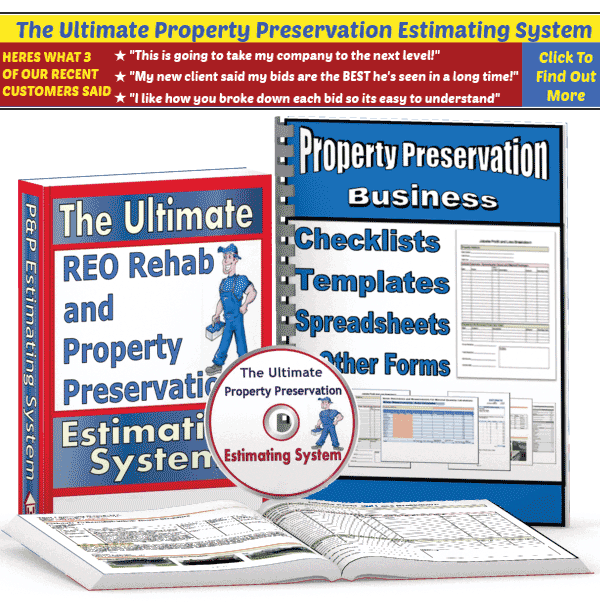 QUESTION: How much money can I make working as a property preservation contractor? ANSWER: Your success as a property preservation contractor is directly related to your dedication to continually educating yourself about REO construction issues as well as how to properly manage cash flow. From our own experience, the sky is truly the limit. Our business has grown at a rate of 100% each year since we first started working in this specialty over 5 years ago. This is definitely a great opportunity to ride the wave of a current trend. But you must understand that property preservation is a business and just like any other business, there are many different working parts involved, all of which you are going to have to learn and master. So before you get too excited, you must understand that even though there is a ton of work available in this niche construction business, it takes hard work and the willingness to educate yourself on a continuous basis. And don’t forget the statistics about how more than 90% of new construction businesses go out of business within the first 5 years. QUESTION: How do I get the national Property Preservation companies to start sending me jobs? ANSWER: Getting clients will be one of the easiest parts of this business. Most national preservation companies have a revolving door of vendors coming and going so there is always an opportunity. Do not make the mistake of landing an account BEFORE you educate yourself first. And keep in mind that there are several different aspects of your business that need tended to before you should have your first job, such as setting up a business entity, getting the proper insurance policies, educating yourself and establishing some important business systems. You may even want to consider becoming a subcontractor for another property preservation contractor, in order to get practice because you only get one chance when you sign on to work directly for the clients. One great alternative is to hire a property preservation business coach to walk you through the process, which will shave a couple years off the learning curve as well as help get your business organized and off to a good start. Follow this link to our FREE database of national property preservation companies. QUESTION: I read that the foreclosure cleanup business is “overly competitive” and not worth getting into. Is there any truth to that statement? ANSWER: The truth of the matter is that there is still a ton of opportunity to grow a successful business in this field for anyone with basic business skills, common sense and motivation, regardless of their geographical location. The reason for this is because most new contractors fail to properly educate themselves before jumping into the property preservation world and they don’t realize that this business is much different than a typical residential construction business. I have read similar postings and people who post such comments are going to figure out sooner or later that it is their attitude, lack of education & misunderstanding about entrepreneurship that causes them all their financial troubles. Not to mention, they will probably be posting something negative about the next business field they try to get into. QUESTION: Do the banks really want their foreclosures cleaned out and repaired but they don’t want to pay market rates? ANSWER: If you listen to the people yapping away in any of the Property Preservation forums, you’d think so. However, experienced business people can clearly tell you that the people who spend their time complaining in these forums never actually discuss anything productive, such as the many creative ways to increase your business’s income while at the same time decreasing your expenses. Plus they are basically sabotaging themselves by talking badly about their customers. Basic common sense tells most of us that we should NEVER talk badly about our customers, especially on the internet. It’s really no surprise that those people are having such a hard time running their businesses. The key is to educate yourself not only about property preservation but also about building and managing a successful business. However, there are certain types of repairs that have set pricing and other repairs that involve estimates. The key is knowing how much the various repairs will cost you. So if you somehow ended up getting property preservation work before you educated yourself about the various costs, then you very well might not make any money. 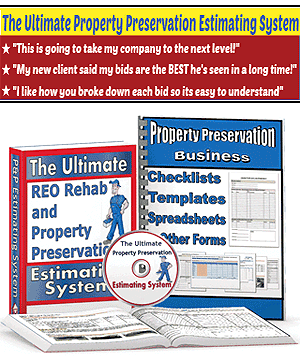 QUESTION: Is there any business management software that was created for property preservation contractors? ANSWER: There are several choices when it comes to property preservation software that can help you manage your business. Property preservation is a very unique niche because it involves typical repair work, maintenance tasks, field service type tasks and property inspections. Most of the property preservation software solutions currently available are not “all inclusive” so you will have to purchase a separate accounting software solution. Your only other option is hiring a software developer to create your own custom made software. Trying to operate without some type of specialized software is the quickest path to failure. We have tested out a few of the available products but ended up creating our own custom solution.